Understanding of the plant genome requires knowledge of both the role and function of the genes as well as the repeatome component. Repeatome of eukaryotic genome, which is the main object of our laboratory research, considered as a mobile, rapidly changing entity thus reflecting trajectories of the short-term evolutionary change. It consists of several large classes’ among which transposable elements and satellite DNA predominate. 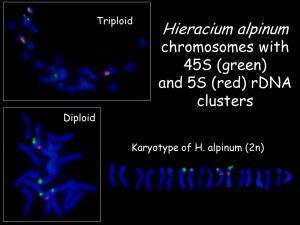 Recent studies suggest that repeatome components, that are predominantly concentrated in the heterochromatic regions of chromosomes, are involved in a series of functions ranging from chromosome organization and pairing to cell metabolism and speciation. Despite a growing awareness of its structure and functional significance, the evolutionary dynamics of repetitive elements remain relatively uncharacterized especially in non-model plant species, although this characteristic is particularly important for understanding genome restructuring in micro- and macro-evolutionary processes. The aim of our laboratory is to study repeatome components dynamics in genomes of several species of different Angiosperm taxa on cytogenetic level. In our research we use classical and molecular-cytogenetics methods in combination with the methods of molecular-genetic, and (recently) with Next Generation Sequencing approach. Laboratory has modern equipment such as Zeiss Axioimager 2 microscope, TermoBrite programmable system for in situ hybridization, Bio Raptor sonicator etc.